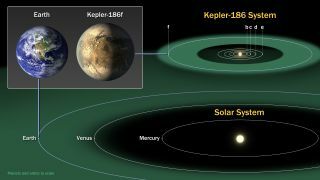 This diagram shows the position of Kepler-186f in relation to Earth. COLORADO SPRINGS, Colo. — Humanity will have the tools to detect alien life in the next two decades, but whether scientists can actually find life in another solar system depends a lot on luck, a panel of experts said Wednesday (May 21). While the James Webb Space Telescope, expected to launch in 2018, will have the ability to search for the chemical signatures of life in the atmospheres of alien worlds, it doesn't necessarily guarantee that scientists will find extraterrestrial life somewhere in the universe. No one is sure how life begins or how ubiquitous it is, making it very difficult to pinpoint when and where to find it, scientists said during a session here at the National Space Symposium. "We can't really tell what life is," MIT astrophysicist and exoplanet hunter Sara Seager said. "All we can do is work with what life does. Life metabolizes and generates gasses, so that's what we're looking for … The good news is, whatever life is, as long as it uses chemistry, we're all set." A mission still in the early stages of development could also help scientists investigate alien worlds even without the use of a large telescope. Called a "starshade," the huge sunflower-shaped craft would block light from a star to allow a well-positioned space telescope to look at the atmospheres of rocky planets orbiting sun-like stars, a historically difficult feat. By using the starshade, scientists can hunt for an "Earth twin" orbiting a yellow star in the habitable zone like Earth, the only planet scientists know hosts life. "We'll have the capability to find it [life] and we'll have that capability within a decade with James Webb and hopefully within two decades with an Earth twin, but beyond that, it's really just up to chance," Seager, who is affiliated with the starshade group, said. Life could also be lurking in our solar system, and scientists wouldn't necessarily need a huge telescope to figure that out. NASA has started investigating a possible mission to Jupiter's icy moon Europa to be launched sometime in the 2020s. Scientists think it's possible that microbial life could survive in the ocean beneath the moon's ice shell. Finding life under Europa's icy shell could also impact the hunt for living things outside of the solar system. "I think it's fair to say that we just want to see one example," Seager said. "If we see one, we almost know that it's everywhere because we need to be reassured, we need confidence that life is actually ubiquitous."